Living in Southwestern Illinois, you find Cahokia Mounds almost in your backyard. Growing up, I, like everyone else, took the requisite school field trips and learned about the people who once lived there. I was fascinated by its size and scope and how it once rivaled cities like London, Paris, or Mexico City in its influence. Now, working in the tourism industry, I give directions and encourage people to go see the mounds. I sometimes wonder, though, how much we really think about Cahokia Mounds or work to preserve them. The first thing that always stands out to me when I visit Cahokia Mounds is not the number of mounds or the impressive height of Monk’s Mound, but the billboards that have been placed right in the heart of the site and the highway that cuts it in half. 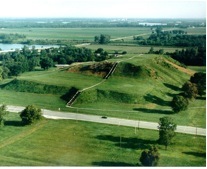 I am always amazed that such a wonderfully historic place as Cahokia Mounds has been so recklessly treated. Of course, one could make the argument that the mounds are available to everyone at no charge, and some trade-offs are therefore to be expected. After all, commerce and expansion do have a way of making themselves known in even the least likely of places. But even this open availability has become limited recently. With the budget crisis that the state of Illinois is in, the hours and days that the Cahokia Mounds Interpretive Center is open to the public has been drastically cut for the majority of the year. The question I have to ask, then, is are we truly trying to preserve Cahokia Mounds and, if we are, what is going wrong with that attempt? 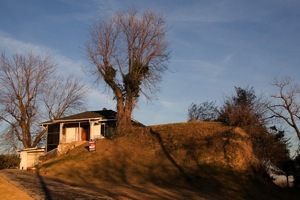 Not long ago, I read an article in National Geographic titled “America’s Forgotten City.” Written by former magazine staffer Glenn Hodges, who had only recently learned of the mounds existence, the story gave me a new perspective on something that we take largely for granted. Hodges’ opinion was that, as a site of Native American history, Cahokia Mounds has fallen victim to the long tradition of American disdain and ambivalence toward Indian culture. 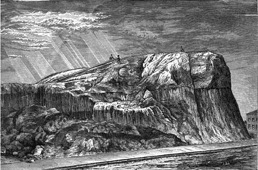 According to this theory, the mounds’ historical significance went against the prevailing eighteenth and nineteenth-century opinion that Native Americans were savage peoples who were incapable of living a “modern” or “civilized” existence. An Indian city was simply too much for Americans to comprehend. As such, farmers in Illinois and city planners in Missouri demolished the mounds with careless abandon, finding them either a nuisance in the middle of a cornfield or more valuable as fill dirt in the city. This is an intriguing hypothesis, and, while I am not sure if I am totally sold that this is the exact answer, I do think that it provides some interesting insight. When it comes to Cahokia Mounds, or any historical site, what preservation ultimately comes down to is personal involvement. Local or national politics will always have an agenda, one which usually runs counter to the best interests of history in favor of more immediate financial goals. It is up to us to actively engage with history and show its importance, whether you are the teacher who leads the fieldtrip, the hotel clerk who gives suggestions to tourists, or, as featured in the National Geographic article, a local man who takes it upon himself to care for and maintain a neighborhood historical marker.